Ab jane woh shokh, yaa na jaane. To accept or say no is upto my sweet. This was the ibteda (beginning) of my love. A new phase of my life, back then; I felt that it would decide my fate. If my heart is accepted, then aafreen, otherwise my name will join the list of aashiqs whose love story ended before it ever began. Kya kahoon aur kahne ko kya rah gaya. What other words can describe your beauty. I have no words to tell you how beautiful she is. Her glowing face, her long raven tresses, her honey dripping voice, her graceful gait like a gazelle, and her hazel eyes. Tera husn dast-e-isah, teri yaad rooh-e-mariam. Woh zamin jahaan giri thi tere gaissuon ki shabnam. Na hua ke mar miten hum, na hua ke ji uthe hum. Your beauty is the hand of Christ, your memory Merriam’s face. Fertilized by dew of your fragrant lochs. Nor we have will to live, nor the strength to die. Jab liya hun main nam tuj lab ka. Whensoever I mention your lips. Dil-e-nadaan tujhe hua kya hai? Aakhir is dard ki dawa kya hai? Kaash puchho ke mudda kya hai? What ails thee, my silly heart? What balm for your ache, at last? Would that you ask, what I crave? Shauq-e-dil muhtaaj hai taqraar ka. Is to see the glorious flush of dawn. Lo, my heart yearns again. Yeh aashiq kaunsi basti ke yaarab rahne waale hain. Strange are their looks, out-of-this world they seem! Wherefrom, O Lord, do these lovers spring? Ab to izhaar-e-mohabbat barmila hone laga. Love is now proclaimed without least reserve. Ke jion be-hosh karti hai sharaab, ahista, ahista. As wine benumbs our wits, step by step. It’s only the beginning, why dost thou groan? O, wait and see what happens as you onwards move. Dil hua mubtla dildaar ka. I’ve lost my heart to my sweet heart. Dikhla apas ke kad kon kiya nahin nihaal. Nor with her stately presence uplifted my state. Kya kiya maine ke izhaare tamanna kar diya. O, why at all did I express my heart’s desire? Talaash mein sahar baar baar guzri hai. Woh baat unko bahut nagawaar guzri hai. Ajib rang mein ab ke bahaar guzri hai. Looking for you the morn has called again & again. To that he has taken very grave offence. In what queer way we’ve spent this spring. Nobody heard my cry, but nothingness. All words were lost there. Days passed. Months passed. And even did the years. Nothing was exchanged between us. There was vast, immense, dark and dead silence. My heart was crushed, that was the first time I realized it. Ke jis ko kaso ne kabhi wa na dekha. Tere ishq mein hum ne kya kya na dekha? Kabhi tune aakar tamaasha na dekha. What use then, our earthly pilgrimage? None has ever seen it bloom. What all haven’t I suffered in love? Alas, you haven’t seen this sight. Atka kahin jo aapka dil bhi meri tarah. Heart, like mine, somewhere gets entwined. Woh jaa raha hai koi shab-e-gham guzaar ke. Mat puchh walwale dil-e-naakarda kaar ke. There goes lonesome man, ending his night in grief. O what a swell and surge within my powerless heart. Teri aarzoo hai, agar aarzoo hai. You are my desire, if I harbour one. Bahut be-aabroo ho kar tere kuche se hum nikle. Many a wish have I realized; yet I yearn for more. Humiliating much more was my exit from your door. Jo dil pe guzarti hai raqam karte rahenge. Ek tarz-e-tamanna hai so hum karte rahenge. Record shall we the tale of our heart. A style of submission will be our creed. 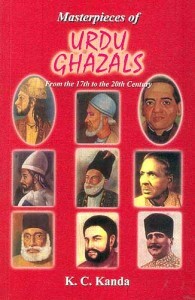 The English translation of the Urdu poetry is taken from the book “Masterpieces of Urdu Ghazals” by K.C. Kanda, Sterling Press, India. This was the first piece of writing I put together. I was under many spells, one of them being the Urdu poetry. Hmm really nice after reading this I was in total differnt world ..its all bcse of the writer how he furnish his words in front of the reader..gud work Mr.Nagi ..keep it up..! !